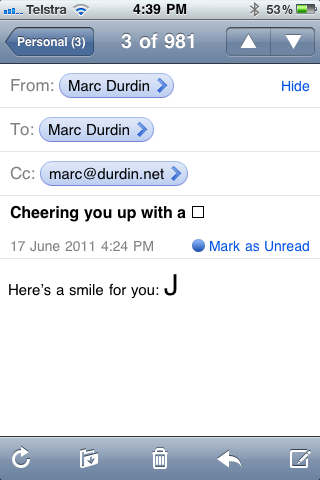 Have you ever encountered an email with a puzzling J or L sitting in the middle of the text? I certainly have! Here's the story. Outlook (and Word), for many years now, has included an autocorrect feature that converts 🙂 into . 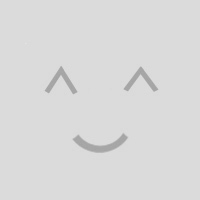 Originally, this happy little smiley face was in the Wingdings font, which replaced each of the useable codepoints between 32 and 255 with symbols. I'm sure you can guess now that the letter J in Wingdings is, in fact,  and the L in Wingdings is ! 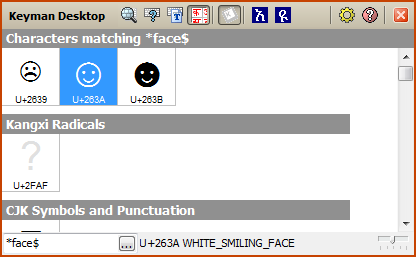 Now Unicode does have a WHITE SMILING FACE character ☺ at U+263A. 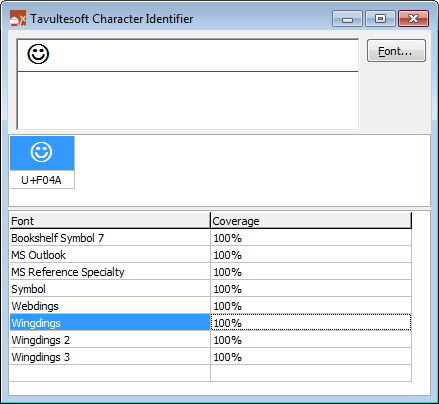 So, now that Unicode has had a smiley character for years now, does Outlook use this spiffy character? 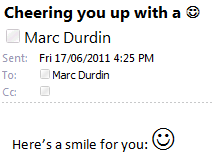 Oooh, look at that – I can paste the smiley into the subject and it looks just luverly. But what about that title bar? Already things are going a bit pear shaped! And what does Windows show when I press Alt+Tab? So… U+F04A. Not quite what one would have expected – it looks like this is a Private Use Area character. What happened to that letter J? 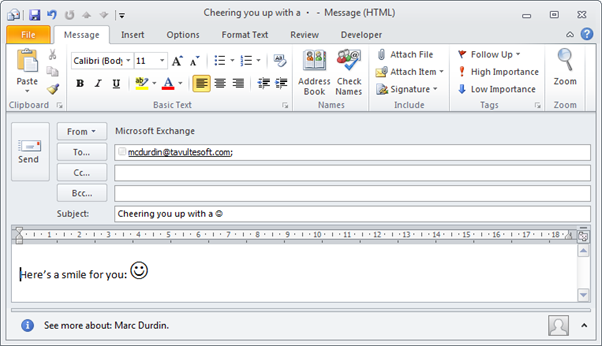 Not sure that's going to work too well when we send it to someone else. But what if I sent it to myself? 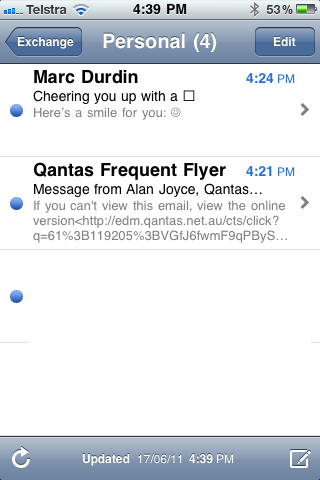 Press Alt+S, off goes the email. 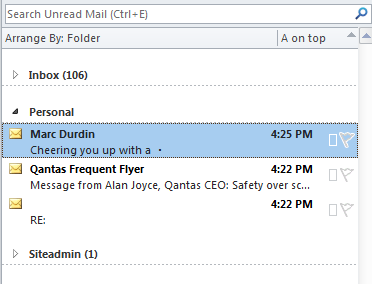 Ooh, look new mail notification, I'm already feeling happier! Oh wait, no I'm not. I didn't even get a single smiley in that notification 🙁 But I did get a letter J! But what about when I look at my Inbox? Nope, no hope there either. Hey, at least it has the same middle dot, right? I have to actually look at the message itself before any happiness can take place. Then I get two lots at once! Now it just so happens that I have an iPhone. What's the story when I look at the happy face there? 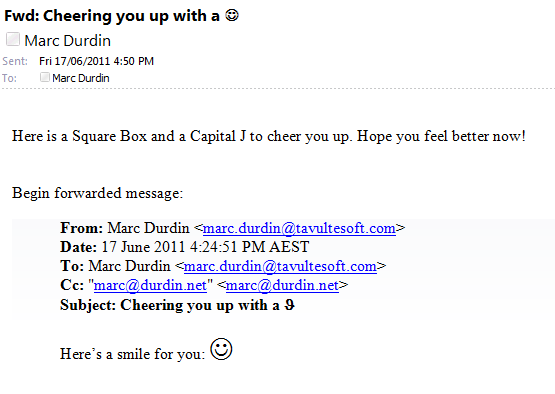 So, a happy square box in the subject but we *actually* get a happy face in the text! Wow! But I want to read the whole message so I can forward it on like any good chain letter! Let's open that email. Whoa. Where's my happiness? Whatever. 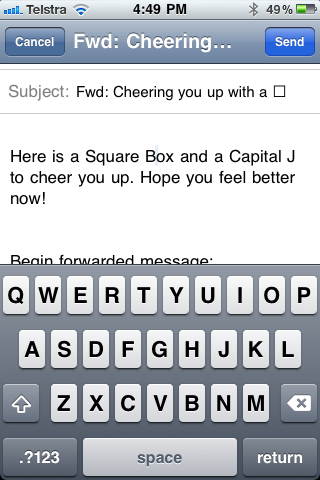 I'll forward it anyway, who knows, perhaps the letter J will cheer someone up! And moments later, I get a beautiful message from myself! But at least the Smiley is back! I'm not going to try and explain this behaviour. I think it must be magic.